1. Does it really matter if it is a house or a condo? Why? 2. Why do I have to make such a big down payment? I only had to pay 20% down on my home in (some other state). 3. What’s the difference between an investment property and a second home? What differences should I expect for each? 4. How will my insurance requirements be different for a vacation/second home vs. primary residence? (a) Location from the borrower’s principal residence. It is required that there is a reasonable distance between the location of the second home and the principal home. If the second home is located on a beach that is less than an hour’s drive away, then you will be granted a second mortgage. However, if it is further inland, then the primary home must be located more than one hour’s drive away from the second/vacation home. The general distance accepted is at least 50 miles away. (b) Must be occupied for some portion of the year. Lenders require that the second home be occupied for some portion of the year. Depending on the location of the home, this can be done seasonally or several times during the year. For properties located in a ski or beach area this can be seasonal. If it’s a lake house then you should make several visits there. The property must remain suitable for occupancy at any time during the year. (c) Only one-unit properties can be financed. For purposes of a second home, only a one-unit property can qualify. Duplexes or multi-unit properties are considered to be investments by lenders. A condo is one of the houses that can qualify for a second mortgage. (d) The property must not be rented out. Being your home, the lender is strict to ensure that you don’t rent it out or subject the property to a timeshare arrangement. The borrower must have exclusive control over the property. Agreements with property management firms to take control of the property are also not allowed. (a) Cash. According to the National Association of Realtors, 36 percent of all home buyers in 2010 paid for their houses in cash. This is the best option, but the majority of people are unable to save enough money to purchase a home in cash. (b) Conventional loan. This is the most common option that many borrowers tend to choose. Borrowers must be prepared to make a larger down payment (more than the usual 20 percent for the primary mortgage) for the loan to be processed. You will also pay higher interest rates and meet other tighter requirements compared to those of a primary mortgage. For a second home guaranteed by Freddie Mac or Fannie Mae, the down payment is 20 percent. However, the rate is higher for individual lenders, usually 30 or 35 percent. This rate is higher because lenders argue that a borrower has two loans and the risk of defaulting is high. (c) Home equity loan. If a homeowner has substantial equity in their home, this becomes the best option. It’s only unfortunate that many homeowners have lost equity in their homes because the value of homes has dropped drastically in the market during recent years. Additionally, many lenders fear that if a homeowner bumps into financial difficulties then they will prefer to clear their primary mortgages in preference to second home mortgages. 3. Many people tend to use the terms “second home” and “investment property” interchangeably in an attempt to describe property that does not qualify as a primary residence. However, there are a number of differences between an investment property and a second home. Investment property can be defined as property that is purchased or acquired for purposes of generating income, taking advantage of particular tax benefits, or enjoying profit from appreciation. If you purchase property that will be used to make some gains instead of being your residence, then it is legally defined as investment property. It must not be your primary residence. Different types of investment property include commercial property, residential rental property, and property purchased with an intention to resell. In comparison with primary and second homes, loans for investment property are charged a higher interest rate. A larger down payment must also be made. A second home is defined as property that becomes your residence in addition to the primary residence you have already. In simpler terms, it is a vacation home that you visit occasionally. A second home mortgage usually has a lower interest rate than an investment property loan. The down payment is also lower especially if it is approved by Fannie Mae or Freddie Mac. 4. 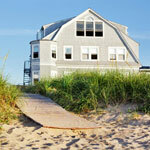 There are different insurance recommendations for second homes for a variety of reasons. Insurance protects your home from storm damage, lightning, burglary, fire, vandalism and other perils. It may also include some minor cover for risks from accidents such as a dog bite, a slip-and-fall accident, or an injury as a result of an accident on the property itself. Depending on the location and the weather conditions in the area where your second home is located, getting an insurance cover can be difficult. For instance, you will need to get a flood insurance cover for your second home because it is not covered in the standard insurance policy for a second home. If the home is located in a forested area, then installing a fire-prevention system will reduce the overall cost. Earthquake insurance is usually not covered and you will have to purchase this independently. Second home insurance is generally higher than primary home insurance because it is more susceptible to burglars as a result of your absence many times during the year. Damages caused by storms may also be common because you are not always around to fix the house. Taking steps to keep your second home secured and maintained can save you more than 20 percent of the insurance cover. If you are buying a condo, the condo association will provide the insurance cover. Keeping a watchful eye on your home by appointing a caretaker may help to convince the insurer that you are responsible. This may lower the cost of insurance.